Spray 4- to 5-quart slow cooker with cooking spray. In small bowl, mix brown sugar, salt, garlic powder, mustard and chili powder. Rub seasoning mixture over pork. Place pork in cooker. Sprinkle any remaining seasoning mixture that doesn't stick to pork over top of pork in cooker. Remove pork from cooker; place on cutting board. Remove liquid from cooker; skim fat from liquid and reserve liquid. Cool pork slightly. With 2 forks, shred pork. Return to cooker. Stir tomato sauce, chipotle chiles and adobo sauce into shredded pork. If desired, stir in some of the reserved cooking liquid for desired moistness. Increase heat setting to High. Cover; cook 15 to 30 minutes longer or until hot. Spoon about 1/3 cup pork mixture into each bun. 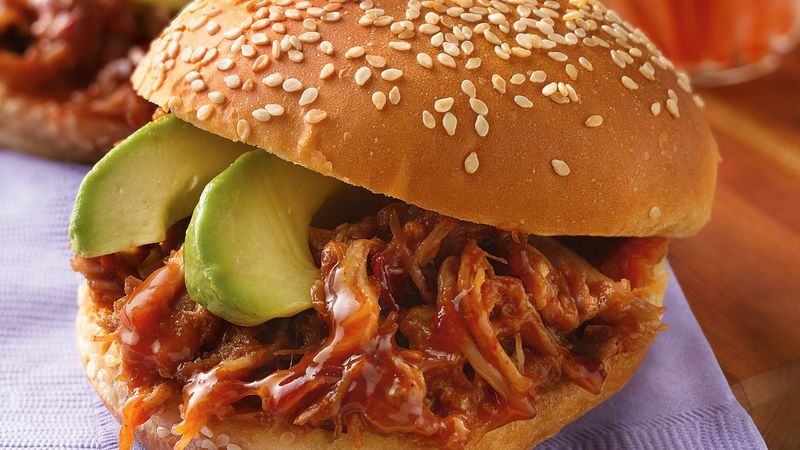 Place a few slices of avocado over pork in each bun. Pork mixture can be kept warm on Low heat setting up to 2 hours; stir occasionally. Complete this meal with carrot sticks, and corn chips. Leftover pork makes a tasty burrito filling or tostada topping.